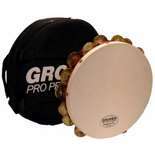 The Grover Pro Percussion T2/HTC 10" Double Row Tambourine features Heat-Treated Copper tambourine jingles, double mounted premium white skin head, captive pin system, staggered jingle slot configuration, solid hardwood shell, and reduced width grip. A free tambourine bag is also included. 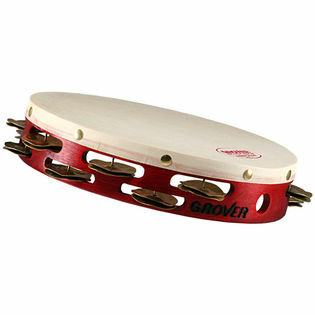 Orchestral percussionists asked Grover Pro to create a dry tambourine with dark sonic focus. This Heat-Treated Copper model fits the bill and gives percussionists a tambourine that adds the darker hues to the orchestral palette of sound colors. The T2/HTC Tambourine is dry and "crunchy" like the Heat-Treated Silver, but has a darker sound profile. Absolutely love this tambourine. Always getting compliments from other percussionists about how great it sounds. Excellent shaking rolls, and a crisp dry sound makes it really easy to be articulate at any dynamic level.